^ van Belle, Gerard T.; von Braun, Kaspar (2009). “Directly Determined Linear Radii and Effective Temperatures of Exoplanet Host Stars”. The Astrophysical Journal 694 (2): 1085–1098. arXiv:0901.1206. Bibcode: 2009ApJ...694.1085V. doi:10.1088/0004-637X/694/2/1085. http://iopscience.iop.org/0004-637X/694/2/1085/fulltext/. ^ a b c d e f Fuhrmann, Klaus; Pfeiffer, Michael J.; Bernkopf, Jan (August 1998), “F- and G-type stars with planetary companions: upsilon Andromedae, rho (1) Cancri, tau Bootis, 16 Cygni and rho Coronae Borealis”, Astronomy and Astrophysics 336: 942–952, Bibcode: 1998A&A...336..942F. ^ Simpson, E. K.; Baliunas, S. L.; Henry, G. W.; Watson, C. A. (November 2010), “Rotation periods of exoplanet host stars”, Monthly Notices of the Royal Astronomical Society 408 (3): 1666–1679, arXiv:1006.4121, Bibcode: 2010MNRAS.408.1666S, doi:10.1111/j.1365-2966.2010.17230.x. , as "HD 9826". ^ Takeda, Yoichi (April 2007), “Fundamental Parameters and Elemental Abundances of 160 F-G-K Stars Based on OAO Spectrum Database”, Publications of the Astronomical Society of Japan 59 (2): 335–356, Bibcode: 2007PASJ...59..335T, doi:10.1093/pasj/59.2.335. ^ a b Buccino, A. et al. (2006). “Ultraviolet Radiation Constraints around the Circumstellar Habitable Zones”. Icarus 183 (2): 491?503. doi:10.1016/j.icarus.2006.03.007. http://adsabs.harvard.edu/abs/2005astro.ph.12291B. ^ a b Lowrance, P. et al. (2002). “A Distant Stellar Companion in the υ Andromedae System”. The Astrophysical Journal Letters 572 (1): L79-L81. doi:10.1086/341554. http://cdsads.u-strasbg.fr/cgi-bin/nph-bib_query?2002ApJ...572L..79L&db_key=AST&nosetcookie=1. ^ Butler et al. (1997). 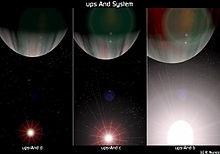 “Three New 51 Pegasi-Type Planets”. The Astrophysical Journal Letters 474 (2): L115?L118. doi:10.1086/310444. http://www.iop.org/EJ/article/1538-4357/474/2/L115/5590.html. ^ Shkolnik, E. et al. (2005). “Hot Jupiters and Hot Spots: The Short- and Long-term Chromospheric Activity on Stars with Giant Planets”. The Astrophysical Journal 622 (2): 1075?1090. doi:10.1086/428037. http://www.iop.org/EJ/article/0004-637X/622/2/1075/61179.html. ^ McArthur, B., Benedict, G. F., Bean, J., & Martioli, E. (2007). “Planet Masses in the Upsilon Andromadae system determined with the HST Fine Guidance Sensors”. American Astronomical Society Meeting Abstracts 211. ^ Han, I. et al. (2001). “Preliminary Astrometric Masses for Proposed Extrasolar Planetary Companions”. The Astrophysical Journal Letters 548: L57-L60. doi:10.1086/318927. http://www.iop.org/EJ/article/1538-4357/548/1/L57/005774.html. ^ Pourbaix, D. and Arenou, F. (2001). “Screening the Hipparcos-based astrometric orbits of sub-stellar objects”. Astronomy and Astrophysics 372: 935?944. doi:10.1051/0004-6361:20010597. http://adsabs.harvard.edu/abs/2001A%26A...372..935P. ^ Lissauer, J., Rivera, E. (2001). “Stability analysis of the planetary system orbiting υ Andromedae. II. Simulations using new Lick observatory fits”. The Astrophysical Journal 554: 1141?1150. doi:10.1086/321426. http://simbad.u-strasbg.fr/cgi-bin/cdsbib?2001ApJ...554.1141L. ^ Ford, E. et al. (2005). “Planet-planet scattering in the upsilon Andromedae system”. Nature 434: 873?876. doi:10.1038/nature03427. http://simbad.u-strasbg.fr/cgi-bin/cdsbib?2005Natur.434..873F. ^ Rory Barnes; Richard Greenberg (2008年). “Extrasolar Planet Interactions”. arXiv:0801.3226v1 [astro-ph]. ^ Trilling, D. et al. (2000). “Circumstellar dust disks around stars with known planetary companions”. The Astrophysical Journal 529: 499?505. doi:10.1086/308280. http://simbad.u-strasbg.fr/cgi-bin/cdsbib?2000ApJ...529..499T. ^ Curiel, S.; Cantó, J.; Georgiev, L.; Chávez, C. E.; Poveda, A. (2011). “A fourth planet orbiting υ Andromedae”. Astronomy & Astrophysics 525: A78. Bibcode: 2011A&A...525A..78C. doi:10.1051/0004-6361/201015693. http://www.aanda.org/index.php?option=com_article&access=standard&Itemid=129&url=/articles/aa/abs/2011/01/aa15693-10/aa15693-10.html. ^ a b c d e f g h i j Ligi, R.; Mourard, D.; Lagrange, A.M.; Perraut, K.; Boyajian, T.; Bério, Ph. ; Nardetto, N.; TallonBosc, I. et al. (2012). “A new interferometric study of four exoplanet host stars : θ Cygni, 14 Andromedae, υ Andromedae and 42 Draconis”. Astronomy & Astrophysics 545: A5. arXiv:1208.3895. Bibcode: 2012A&A...545A...5L. doi:10.1051/0004-6361/201219467. http://www.aanda.org/index.php?option=com_article&access=doi&doi=10.1051/0004-6361/201219467&Itemid=129. ^ a b c d e McArthur, Barbara E.; Benedict, G. Fritz; Barnes, Rory; Martioli, Eder; Korzennik, Sylvain; Nelan, Ed; Butler, R. Paul (2010). “New Observational Constraints on the υ Andromedae System with Data from the Hubble Space Telescope and Hobby Eberly Telescope” (PDF). The Astrophysical Journal 715 (2): 1203. Bibcode: 2010ApJ...715.1203M. doi:10.1088/0004-637X/715/2/1203. http://hubblesite.org/pubinfo/pdf/2010/17/pdf.pdf.